Storm Reading, Part 2–the second storm, with snow! This is the cruelest storm of all, following on the heels of Sandy, when so many people have yet to get power back and so many others have lost their homes. I worry about the residents of those barrier beach communities, in New Jersey and in Queens and Long Island that have been so devastated by Sandy, and now we’ll have 2 more days with the threat of power outages from wind, rain, and snow. My lights were flickering in the early afternoon, not a good sign and it’s been snowing steadily here since noon. The lights just flickered again! I started reading an older Richard Russo novel, The Risk Pool, and I think it’s one of his best, if you don’t mind coming of age stories without plots. I’m about half way through it now and enjoying Russo’s language immensely. He’s done the hard thing: created characters that are dishonest, irresponsible, and unethical but you’re eager to spend time with them, can’t wait to see what they’ve done now. The main character is Ned Hall, son of a charismatic, petty crook of a father and a mother who can’t cope. We follow Ned from about 9 years of age through college. 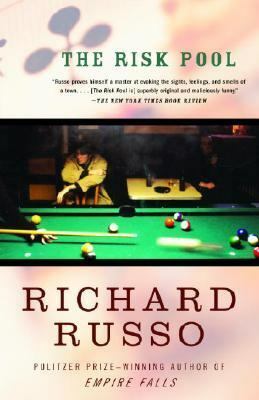 Like most of Russo’s novels, it takes place in upstate New York, in the small town of Mohawk, where the denizens of the bars, pool halls, and greasy spoon diners provide the Greek chorus for Ned and Sam’s life. What a great cast of lowlifes, amiable and not-so-amiable drunks, misfits, and cardsharps Russo has created! Many of the characters have great nicknames, bestowed by Ned’s father, who is never at a loss for an insult or an excuse. Ned’s growing up takes place among these folks and he learns lessons about human nature that are hardly to be found elsewhere. The novel reminds me of Tobias Wolff’s This Boy’s Life for its insight into the way children make use of the situations they’re put in. It also reminds me of Joyce Carol Oates’s novel Little Bird of Heaven, although Oates’s novel is the dark side of the story, the one Russo chose not to tell. The Risk Pool is very funny; we laugh because we want to assure ourselves that it can’t be true.